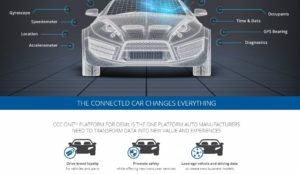 CCC on Wednesday announced CCC ONE for OEMs, “a hyperscale platform” that better ties the automakers to the IP’s user base of more than 350 insurers and 24,000 collision repairers and opens up new revenue streams and repair and claims oversight for automakers. “These solutions can leverage connected car and vehicle data in many ways, including the promotion and sale of new vehicles and OEM-branded parts, usage-based insurance and telematics-enabled claims, safety insights, and shop certification scorecards,” CCC wrote. It’s possible that these metrics now available for OEMs to score certified shops might conversely be grounds for an insurer to downgrade a direct repair program repairer. For example, an insurer might ding a DRP shop for supplements, bills over a certain threshold, or parts replaced instead of repaired. But an OEM might demand repair procedures (like scans) omitted by the adjuster, creating both supplements and higher prices, and the automaker’s repair procedures might dictate the replacement of more parts. Asked Thursday about the contradictory data potentially being tracked, CCC OEM Group general manager and Senior Vice President Andreas Hecht described the company as a neutral data and rules provider. How different industries used that data overlapped and diverged in a Venn diagram, according to Hecht. Each OEM or insurer user made its own decisions on how to parse CCC’s universe of statistics to rate shops — who’d agreed to such scrutiny when they joined the networks. CCC had no part in deciding that criteria, he said. In addition, Hecht noted that the information provider itself maintained a healthy tension between its teams serving OEM, insurer and collision repairer user bases, which helped keep the company neutral. CCC on Wednesday outlined other fascinating “most prominent potential use cases” for its more than 180 million claims and more than a billion trips, and some of these concepts could also directly impact how some collision repairers do business. Two effectively team up insurers and OEMs — whether the insurer wants it or not. The first of these saw CCC suggesting OEMs use it as a means to share vehicle data “to a network of insurers for pay-as-you-drive, pay-how-you-drive, and mileage-based insurance programs.” This is similar to what GM is doing with Progressive, using OnStar telematics data to rate drivers and suggest based off it they seek a policy from the carrier. The other involved CCC offering “(t)elematics-enabled claims solutions that help ease and speed the claims and repair resolution process.” That sounds a lot like CCC Drive’s electronic first notice of loss crash-detection offering, and it suggests a scenario where an OEM is alerted to a collision and gets the ball rolling on the claims process — potentially suggesting a certified shop instead of a DRP one. “CCC processes approximately 3 million total losses annually,” it noted. And finally, CCC recommended automakers use CCC ONE for OEMs to manage recalls. “CCC has detected more than 800,000 vehicles affected by recalls since launching the program in late 2016,” it wrote in a news release. Tracking those not only solves the problem of notifying used-car owners of recalls, but it could be a great display of customer service by partner insurers and shops who participate in the customer notification.